Lovebirds are a favorite among pet birds, often called "pocket parrots," and among the most colorful you'll find. While there are several lovebird species in the world, not all of them are kept as pets. The three most popular species can make charming and loving companions for a bird lover and you don't necessarily need a pair of lovebirds to keep them happy. All lovebirds belong to the genus Agapornis and the order Psittaciformes, making them small parrots. In total, there are nine species of lovebirds. The most common to be kept as pets are the Fischer's lovebird, black-masked lovebird, and peach-faced lovebird. With the exception of the Madagascar lovebird—a native to that island—all lovebird species call the African continent home. They tend to live in small flocks. In the wild, the Fischer's, Nyasa, and black-cheeked lovebird populations are a cause for concern. Though they are not yet on the endangered species list, their numbers are so low that each falls into one of the "threatened" or "vulnerable" categories. Lovebirds are small and compact parrots that are about 5 to 6 inches in length. They are typically a little larger than the common pet budgerigar (parakeet). Pet lovebirds can live up 10 to 15 years or more if properly cared for. Lovebirds can be described as active, curious, feisty, and playful so they definitely pack a lot of personality into a small package. They are very social birds that form deep bonds with their owners and can be very cuddly birds as a result of this. Lovebirds can also be very territorial, aggressive, and jealous if not properly tamed and worked with from a young age. Some experts believe female lovebirds are more prone to jealousy and territoriality than males but birds of both sexes can have wonderful personalities. While not as loud as some larger parrots, lovebirds can still produce a loud, high pitched screech, especially when they're seeking your attention. Their normal chirps and squawks are not overly loud, but they do like to chatter. As a general rule, they are not known for their ability to mimic speech or sounds, although there are always exceptions to the rule. Some experts say females are more apt to mimic sounds or speech than males but both sexes have the potential to chatter. Lovebirds are known for their short and rather blunt tail feathers. Beyond size, this is one of the primary features that distinguish them from budgerigars. Lovebirds also have a stockier build. The colors that these species come in can vary widely from peach to teal to white to green. They all tend to be rather vivid with heads and faces of a different color than the main body feathers. Many of the popular pet lovebirds have mostly green plumage. Various color mutations exist in several species of lovebirds as well. This is particularly true of the peach-faced lovebird, the most popular to be kept as a pet. It is easy to breed in captivity and this has been done for hundreds of years, so you will find many color variations. 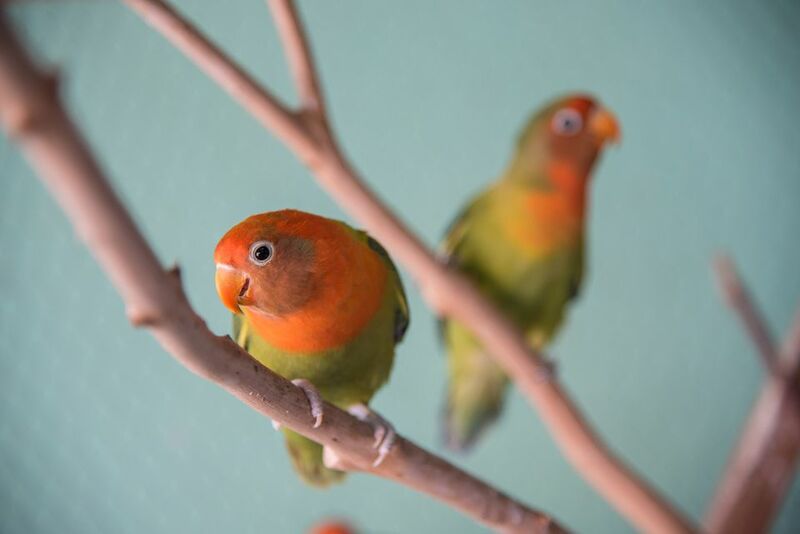 The Absynian, Madagascar, and red-faced lovebirds are dimorphic, making it is easy to tell the males and females apart by the color of their feathers. It is difficult to distinguish the sexes of the other species because they are monomorphic and nearly identical. Some lovebird species have a prominent white eye ring, which is characteristic of parrots. The peach-faced and Swindern's lovebirds lack this feature. The bill of the lovebird is hooked and its color varies by species, from bold orange-reds to pale beige. Their feet are zygodactyl, meaning two toes point forward and two toes point toward the rear. This helps with agility and gives them a better grasp on branches. Regular handling and training are needed to maintain a tame lovebird. Purchasing a hand-raised fledgling will make taming your new lovebird easier but with a little time and patience, you can tame any bird. If you're getting an older lovebird, try to find one that has been handled regularly and has some training to make things easier for yourself. A common misconception about keeping lovebirds is that they should always be kept in pairs. Plenty of single lovebirds do fine without a mate as long as they receive enough attention and social interaction from their owners. That being said, lovebirds are flock animals so they really do thrive when they feel that they are part of a flock and have their own kind to communicate with. If you are short on time to spend with your lovebird it is especially important to get him or her a companion. Lovebirds, like other parrots, should be fed a variety of foods. Wild birds feed on fruits, grasses, seeds, and vegetables and a pet lovebird's diet should be just as diverse. A good pelleted bird food should be the basis of the diet. You can supplement that with a variety of fresh foods and some seeds. Seeds should make up less than 25 percent of the total diet. Try to rotate the kinds of fresh foods you offer. Just keep in mind that it may take your lovebird a little time to adjust to any new things, including food. A cuttlebone bird treat can be provided in the cage for extra calcium. As a bare minimum, you will need a cage that is at least two feet wide by two feet long and two feet tall. However, a larger cage is always better. If you can provide a larger cage, focus more on the length rather than the height. This will ensure that your lovebird can spread its wings and even fly across the cage some. Bar spacing should be no more than 1/2- to 5/8-inch and should be oriented horizontally to allow the birds to climb the sides of the cage. Avoid round cages as they are more likely to damage tail feathers. Provide a variety of perch sizes (including natural branches if possible) to keep your lovebird's feet healthy and strong as well. Like all parrots, lovebirds are quite active and playful. They'll do best with plenty of interaction and playtime. By giving them attention every day, this will also strengthen your bond and prevent unwanted behavior. It is a good idea to have lots of toys on hand and to rotate them throughout the cage to keep these birds occupied. Make sure all toys are zinc and lead-free and that there are no loose threads on cloth that may entangle your lovebird's toes. Lovebirds can be aggressive chewers so keep this in mind when choosing toys. Make sure there are no small parts that can be chewed off and ingested. You should also avoid clips, loose strings, and other small parts in which your bird could get their beak, feet, or head trapped in. Safe toys include wood, sisal, leather, acrylic, and rawhide toys, as well as bells and ladders. Household items such as empty cardboard tubes from paper towel rolls, paper cups, ink-free cardboard, and dried pasta shapes may also be used by your lovebird.